SCMM has been a fixture on my running calendar since the HM I ran in the 1st edition in February 2004. All subsequent editions have been held in January - usually on the 3rd Sunday of the month. Despite the familiarity of the routine and the course (in which I PB'ed in 2013) the mix of excitement and anxiety experienced in the days and hours leading to the start line has also remained a constant. The SCMM is by far the largest and best organised road full marathon in the country. It has also grown leaps and bounds in size and attracts serious recreational runners as well as professional runners from around the country. It looks like over 6,000 runners have registered for the FM tomorrow . Across all categories over 42,0000 runners are expected to hit the roads of Mumbai! As usual I arrived in Mumbai on Friday evening. For the first time the expo and bib collection point for outstation runners was at Richardson and Cruddas in Byculla - it has usually been at the WTC in Colaba except one year when it was at BKC. The bib collection process is usually very smooth and quick at SCMM. This year it was an even quicker process despite the venue being quite crowded with runners when I got there at half past 12. 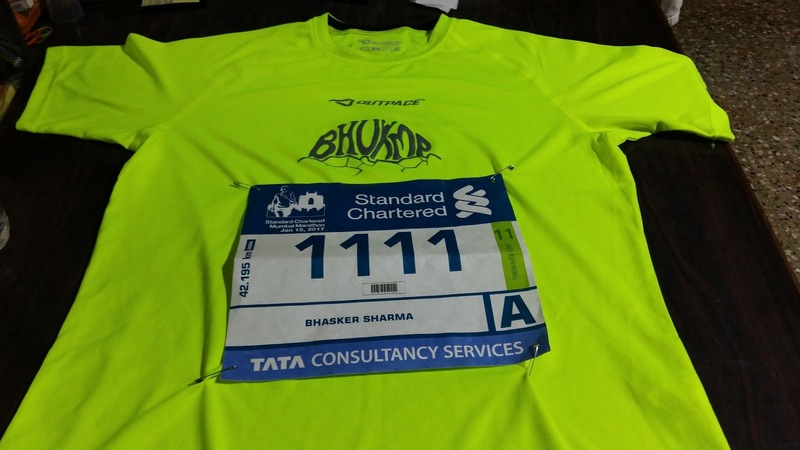 I went to the back office and collected my 'special bib' with zero wait time (Thanks to fellow Bangalore runner Sunil for guiding me on this). I was pleasantly surprised to receive an email from Procam in the last week of December asking for 3 choices of bib nos between 201 and 999998 as a token of appreciation of having run the marathon for 11 years in a row. I got allotted my 1st choice , that is, 1111. (My other choices were 1001 and 345). And this bib no. will be blocked for me for the next 3 years!! My goal this year is to do try and do a sub 3:45 or at least as close to the 3:47:15 of 2016 as possible. Despite the injury woes in September and October I feel in good shape and would be disappointed if the time is slower than 3:50(of course the variables during the race are often unpredictable and beyond one's control). Given the cool weather I expect to start at an average pace of 5:15 per Km for the first 10 Kms, slow down a bit and get to the half way point in about 1:51:30(at average of 5:17 per km) and then try and keep it between 5:20 and 5:25 per km for a sub 1:53:30 2nd half . In any case I am looking forward to another great experience of running on the fantastic Mumbai route - meeting fellow runners from around the country and cheered on by the fantastic crowd of Mumbaikars!! Hoping for the tide to turn..